On Tuesday Feb. 15, China reported its consumer prices (CPI) rose 4.9% year-over-year (yoy) in January, which came in less than expected. Economists were expecting 5.4% inflation, based on a Bloomberg survey. However, after digesting the data, Asian markets closed mixed on that news, with China’s Shanghai Composite staying flat after a choppy trading session. Well, the reason why markets reacted that way is because the lower figure is partly the beneficiary of a previously announced change--effective January 2011--in the weight of items included the CPI basket calculation. Food previously accounted for a third of the index calculation and was the main driver of inflation last year. According to Blomberg, National Statistics Bureau (NSB) said that a reweighting of the CPI, including cutting the contribution from food, boosted the headline rate by 0.024%. Bloomberg quoted Mizuho Securities Asia Ltd. Saying that the CPI calculation shift effect is more like 0.2%. That is, without the change, the CPI may have been 5.1%. 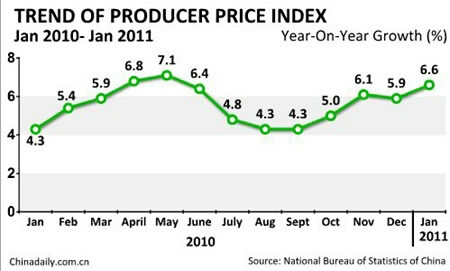 Manwhile, NSB said the Producer Price Index (PPI) spiked 6.6% yoy in January after escalating at 5.9% in December. The component calculation of the PPI also has been revised, including an addition of about 2000 products to the basket and adjusting the weightings. The change reduced January’s yearly PPI inflation by 0.05%, which means the index would have seen an increase of 6.65% without the basket change. Chinese statistic bureau did not disclose a breakdown of the basket for either index. So, the alterations made it quite impossible to directly compare the January data on an apple-to-apple basis to earlier months. Nevertheless, there are still plenty of clues. First of all, it is evident that there's now a broadening escalations spilled over to non-food items as well. Core inflation, stripped of food, rose 2.6% yoy, the highest in at least a decade after rising 2.1% yoy in December. Residence costs jumped 6.8% from a year ago, the most since August 2008. Not to mention food prices soared 10.3% after rising 9.6% in December - Grain escalated 15.1%, fresh eggs climbed 20.2%, and fruit spiked 34.8% from a year ago, according to the official report. 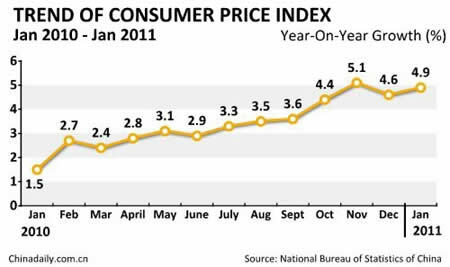 Regardless which way you calculate, January also marks the fourth straight month that the inflation has exceeded Beijing's 4% target. This clearly illustrates measures taken by the Chinese government, e.g., multiple interest rate hikes, raising bank reserves requirement, and letting Yuan appreciate, have not been enough to control surging prices. Furthermore, I personally prefer PPI as an inflation predictor and indicator, as it shows the coming pricing pressure that could be passed down through the supply chain. And the current reading of 6.6% just further supports the view that China’s inflation is far from being under control. China’s inflation problem could be attributed mostly to the over abundant money supply, increasing domestic demand from a growing middle class, and bad weather hurting food supplies. On top of these existing culprits, China may also increase retail gasoline and diesel prices to reflect higher international crude prices, People’s Daily said Feb. 11. 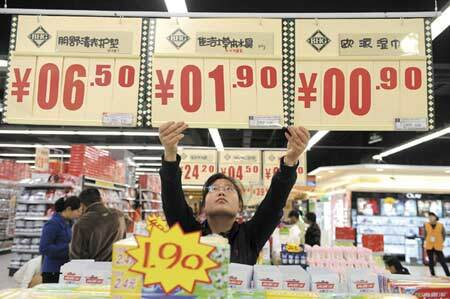 China last increased fuel prices by around 4% on December 22. Moreover, the worst drought in 60 years hitting China northern “wheat belt” will only putting more upward pressure on the already rampant food price inflation, although Beijing so far has downplayed it. China’s money supply surged 48% in two years (which is not that different from the U.S. Fed’s QE), the flood of liquidity has been used mostly to speculate on commodities/raw materials instead of stimulating consumption. As traditional industries, such as steel and textile, are hurting from rising input costs, the most alarming sign is the widening gap between PPI and CPI. This suggests producers and manufacturers have not been able to pass through the cost increase. So, eventually these companies most likely will eat some of the cost increase, which means shrinking margins, while exporting some more to their clients in Europe and the U.S. And the companies that import goods from China will face the same dilemma --absorb or pass through the price increase. Since China’s economy relies heavily on manufacturing and traditional industries, the implication of lower profitability could pose a serious problem for many companies, and China’s economic growth. The importing countries, meanwhile, will likely also suffer from lower corporate margins and high consumer inflation. The United States, a net importer with China in the supply chain of many corporations, will feel that inflationary pain all the way from this side of the Pacific Ocean. Even if the U.S. switches to importing from other trading partners, it will not make much of a difference, as other emerging economies are also suffering from the similar inflation headache. For instance, India’s benchmark wholesale-price index rose 8.23% in January, Indonesia’s inflation is 7% and South Korea’s is 4.1%. Many economists predict that China will likely be forced to take stronger measures that could slow economic growth. Reuters reported China may increase the bank deposit reserve ratio to 23% from the current 19.5%, and the People's Bank of China (PBOC) is also expected to permit the yuan to rise further, according to a report by the State Information Centre under the National Development and Reform Commission. Japan’s Mizuho Research Institute predicted in December that China may raise interest rates up to six times by the end of 2011 (one rate hikes in Feb. 2011 so far). Regardless when or what China’s doing to rein in inflation, it no doubt will put a brake on one of the very few bright spots in the world. While China’s busy tightening and dealing with the once in 60-year mass drought, consumer price inflation, and diminishing margins will likely crop up pretty much everywhere from mass retailers like Wal-Mart, Target, to high tech products from companies such as Apple, Hewlett Packard, and Dell.